Diploma Holders let you protect and proudly display awards, diplomas, certificates and much more. Customized Certificate Holders take the elegance one step further by allowing you to choose the size, color and material of the holder, as well as allowing for nearly endless custom printing opportunities. Add vibrant foil stamps and printing with the school, university or training facility name. Choose from several options below. 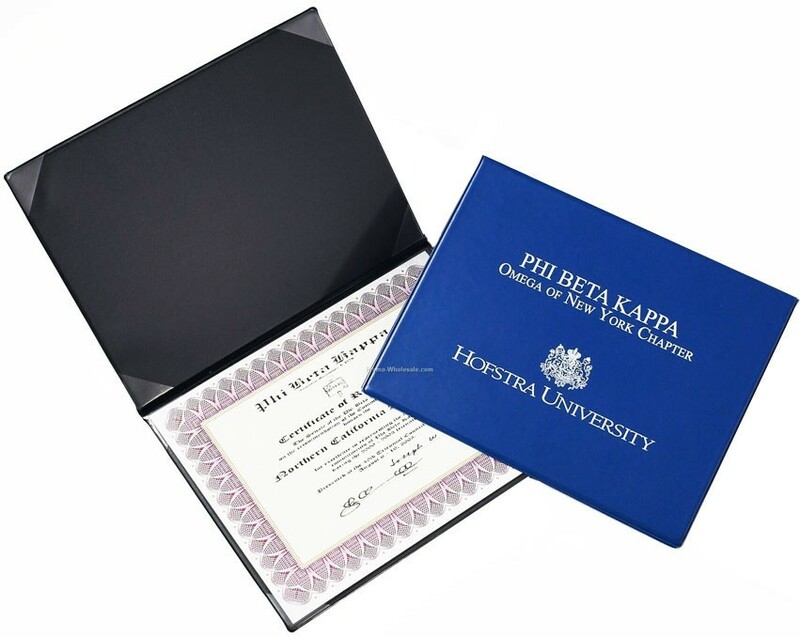 Vinyl Diploma Holders are the perfect complement for diplomas, awards and certificates. They are made to open from either the side or top. Vinyl covers are long-lasting and offer a professional look and feel. 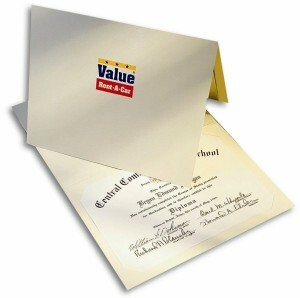 Constructed with 4 clear vinyl corners to hold a certificate or one full sheet clear pocket. Holders can be silk-screened of foil stamped. Quantity: Minimum order of 100. Price breaks available with larger quantities! Turned Edge Diploma Holders provide a high-end look for important occasions, such as graduation, awards, or professional certifications. Your custom printed cover sheets are laminated and turned over chipboard, providing fine graphic reproduction. The inside liner is an attractive silk moire. Available in many colors and features ribbon corners for holding your insert. Paper Diploma Holders offer a less expensive alternative that still protects your award or document and creates an attractive presentation. Four-slits in the back cover hold your document in place. Paper Certificate Holders can be printed, foil stamped, or embossed for a unique look. Quantity: Minimum order of 250. Price breaks available with larger quantities! If you're ready for a quote on some custom diploma holders, call our sales team at (866)537-2244 or email info@buy101.com.